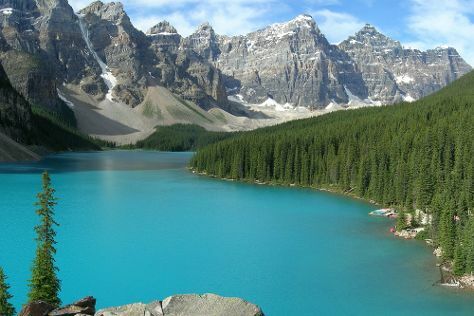 Few experiences captivate the imagination of true nature lovers like holidays in Canadian Rockies, where a string of national and provincial parks protect a landscape of towering peaks, sparkling lakes, virgin forests, and mighty waterfalls. Wildlife galore adds to the area's charm, drawing visitors from every corner of the world. You may be tempted to spend your Canadian Rockies vacation exploring the picturesque roads and railroad routes, but for a well-rounded tour, remember that you can also hike, bike, skate, ski, paddle, and sled your way though this pristine natural scenery. A string of friendly alpine towns scattered across the Rockies serve as ideal resting places after those long days in the great Canadian outdoors. Canadian Rockies is in Alberta. Add Canadian Rockies and other destinations in Canada to your travel plans using our Canada trip builder website .